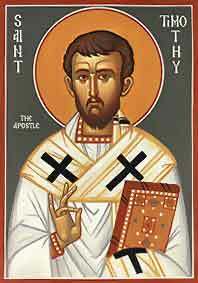 Saint Timothy was a convert of Saint Paul, born at Lystra in Asia Minor. His mother was a daughter of Israel, but his father was a pagan, and though Timothy had read the Scriptures from his childhood, he had never been circumcised. On the arrival of Saint Paul at Lystra the youthful Timothy, with his mother and grandmother, eagerly embraced the faith. Seven years later, when the Apostle again visited the country, the boy had grown into manhood. His good heart, his austerities and zeal had won the esteem of all around him, and holy men were prophesying great things of the fervent youth. Saint Paul at once saw his fitness for the work of an evangelist, and Timothy was ordained a priest. From that time on he was the constant and much-beloved fellow-worker of the Apostle. In company with Saint Paul he visited the cities of Asia Minor and Greece, once hastening on ahead as a trusted messenger, at another time lingering behind to confirm in the faith a recently founded church. Eventually he was made the first Bishop of Ephesus; and there he received the two epistles of his master which bear his name, the first written from Macedonia and the second from Rome, where Saint Paul from his prison expresses his longing desire to see his “dearly beloved son,” once more, if possible, before his death. It is not certain whether Saint Timothy arrived in Rome in time, but devotion to Saint Timothy has always been strong in Rome, which seems to argue for his presence at the martyrdom of his spiritual father. Saint Timothy was of a tender and affectionate disposition, and certainly found his role in the idolatrous city of Ephesus difficult to sustain. Saint Paul, when he writes to Timothy, then a tested servant of God and a bishop advancing in years, addresses him as he would his own child, and seems most anxious about his forcefulness in his demanding role. His disciple’s health was fragile, and Saint Paul counsels him to “take a little wine for his digestion.” Saint Timothy is the “Angel of the Church of Ephesus” of the Apocalypse, its bishop whom Our Lord, too, exhorted to remember his original faith and piety. Not many years after the death of Saint Paul, Timothy, who had surely profited from these counsels, won a martyr’s crown at Ephesus, when on a feast day of the goddess Diana, whose temple stood in that city, he entered into the ungovernable crowd to calm it, exhorting these souls, deprived of the light of truth, to renounce vain worship and embrace Christianity. Wild with idolatrous passion, a pagan struck down the bishop of the Christians, thus freeing him to join his beloved spiritual father in the realm of the Blessed. Dearly Beloved, Follow after justice, godliness, faith, charity, patience, mildness. Fight the good fight of faith; lay hold on eternal life, whereunto thou art called, and hast confessed a good confession before many witnesses. I charge thee before God, who quickeneth all things, and before Christ Jesus, who gave testimony under Pontius Pilate, a good confession: that unto the coming of our Lord Jesus Christ: which, in His times, He shall show who is the Blessed and only Might, the King of kings, and Lord of lords: Who alone hath immortality, and inhabiteth light inaccessible: whom to man hath seen, nor can see; to whom be honor and empire everlasting. Amen. The man I have found is my servant David, on him my consecrating oil has been poured my hand shall strengthen him, my arm shall give him courage. V. No enemy shall have his way with him, no emissary of wickedness shall have power to injure him. Alleluia, allelluia. v. Ps 109:4 Thou art a priest forever in the line of Melchisedech. Alleluia. Behold I have given My words in thy mouth: low, I have set thee over the nations, and over kingdoms, to root up, and to pull down, and to build, and to plant. Graciously receive the offerings made to Thee, O Lord, we beseech Thee; and through the merits of blessed Timothy, Thy martyr and bishop, grant that they may become a help to our salvation. Through our Lord Jesus Christ Thy Son. Who liveth and reigneth with Thee in the unity of the Holy Ghost, one God Forever and ever. R.Amen. O Lord, Thou gavest me five talents, and behold I have gained five more. Well done, thou good and faithful servant; because thou hast been faithful over a few things I will place thee over many things; enter thou into the joy of the Lord. Thou hast fed Thy household, O Lord, with these sacred gifts: do Thou ever comfort us, we beseech Thee, by the intercession of her whose festival we celebrate. Through our Lord Jesus Christ, Who livest and reignest, with God the Father, in the unity of the Holy Ghost, one God For ever and ever. R. Amen.